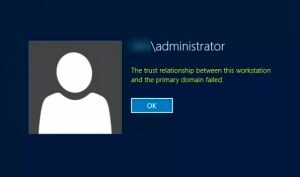 How To Fix “The trust relationship between this workstation and the primary domain failed” Without reboot – It`s simple when you know how ! Single SID has been assigned to multiple computers. After that just logoff and login as domain user . And again logoff the local account and login with domain user . The last option is to take the machine out of the domain to workgroup and then again rejoin the machine to the domain, this will work as well how ever with servers it can cause some problems as this operation will create new SID , this effect depands on the environment .